Check out the all new - STI Out Back HT tires. 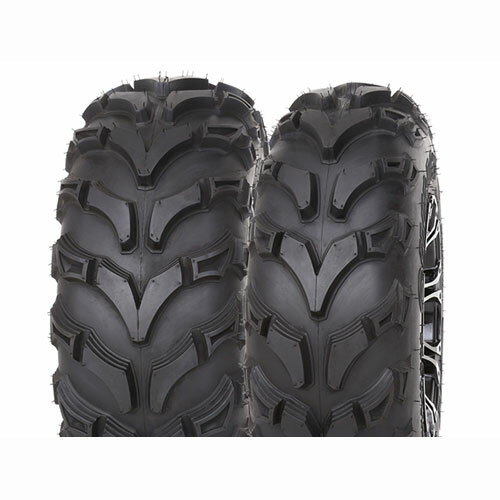 These "all conditions" tires are designed to help mid-size ATVs and UTVs excel at work or play, providing comfort and control of a dedicated trail tire, yet still delivers the grip and cleanout capabilities of a deep, open-lugged bogger. The STI Outback has a surprising light 6 ply carcass and robust rim guards that provide exceptional reliability. Its unique tread pattern's center "V" design provides an OEM-like ride on hard surfaces, while deep, dimpled lugs work aggressively to dig into loose terrain. Its wrap around shoulder lugs supply controlled side bite and its stepped lugs are excellent at shedding mud! HT Tread Depth of 3/4"
Find your tire size in the chart above and then select your tire size below for ordering. Prices vary by tire size, and start at $69.80. The price listed above will match the price of the item added to the cart.